Omega’s Skeleton Tourbillon Co-Axial Platinum Limited Edition has only 18 pieces. Each costing Rs. 1.18 cr. Omega is the only watchmaker ever to have created an automatic central Tourbillon. 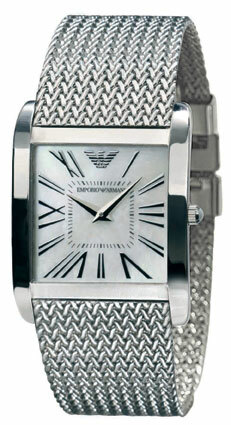 Its titanium cage rotates completely every 60 seconds, offsetting the effect of gravity on the performance of the watch. The movement has a luxurious sun-brushed and circular graining finish with an anthracite galvanic processing; its bridges and mechanisms are hand polished. The rotor with its sapphire plate has been newly designed and is metallized with the words “Limited Edition” and the watch’s individual serial number (out of 18). 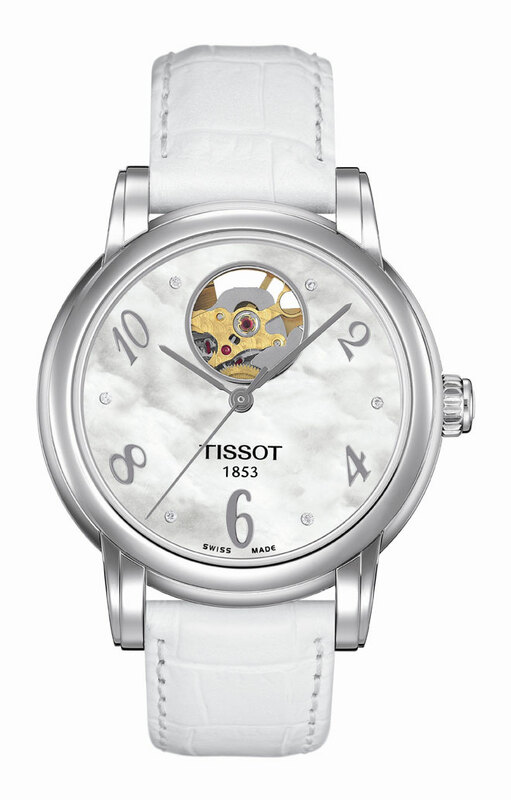 The Central Tourbillon’s hands appear to float freely above the movement. 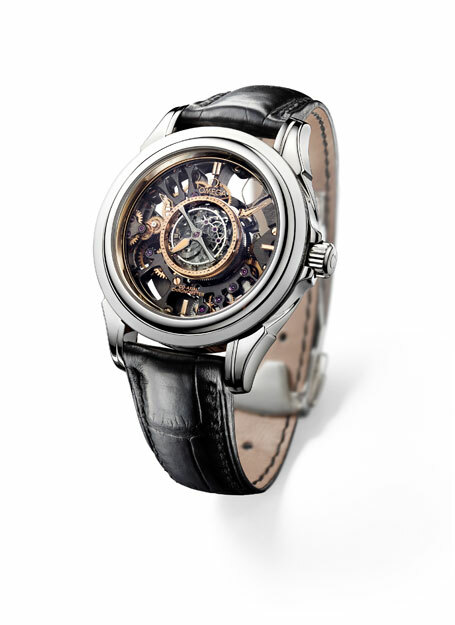 The Skeleton Tourbillon Co-Axial Platinum Limited Edition is equipped with a Breguet balance spring. Only 18 pieces of this Skeletonized Tourbillon Co-Axial Platinum Limited Edition will be produced. The complex movement is assembled from 320 individual parts. When a Central Tourbillon is returned to Omega for servicing, it will be placed in the hands of the original watchmaker. 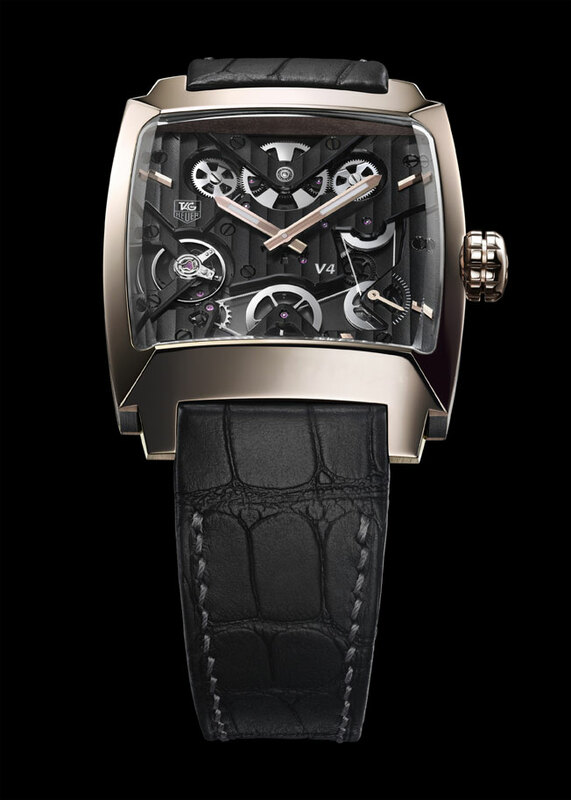 The remarkable calibre is housed in a platinum case presented with a black alligator bracelet. Price: Rs 1,18,30,000. Domed and slender, and inspired by fashion, the quartz movement in cK Connect is housed in a shiny metallised glass, which encircles the wrist with an uncompromised fit. The dial, in black, brown, or mirror, is accented with a complementary black or brown leather strap and a delicately small pin buckle closure. Water resistant up to 30 mts. Once the prerogative of a few watch lovers, the Grande Seconde Minute Repeater is now recognized as an absolute masterpiece of fine watchmaking complications. A formidable challenge because this virtuoso complication plays real music on demand, with a range of high and low notes that tell us where we are in the cycle of time. To within one minute. Two tiny hammers ring out a delicate symphony that has never ceased to fascinate lovers of fine watchmaking since the Age of Enlightenment. Jaquet Droz presents it with an ivory Grand Feu enameled dial, unique in both tint and grain, a generously rounded case in red gold and, above all, its legendary face: the Grande Seconde. Price: Rs 90,90,000. 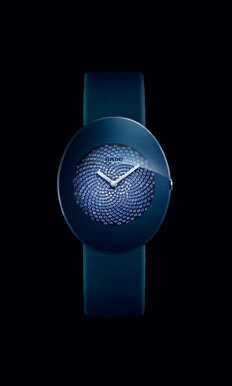 The eSenza Blue Jubilé can be distinguished by its refined elliptical form and enthralling play on light. Elaborate shapes. Emphasised by the gentle linearity of a satin strap, the case creates an oval with perfect proportions, while the entire circular dial is adorned with sapphires in varying shades of blue. Set in a Fibonacci spiral derived from the golden number, they bring a mythical balance to the subtle harmony of blues. On the surface of the dial, time is reduced to the essentials. Two silvered hands alone highlight the sparkle of its geometrical scrolls. They circulate serenely under the curved, edge-to-edge sapphire crystal with its metallic blue finish. The discreet crown is partially hidden under the case band: a detail that completes the perfect integration of the elements and exemplifies the signature of the Rado legend. Price Rs 3,50,000. Hamilton Time Player is inspired by the geographic coordinates system based on lines of latitude and longitude, its unusual timekeeping concept unites finger-operated timekeeping in four up-to-the-minute time zones. This timepiece lets the fingers do the walking, leaving the mind free to exercise its memory and imagination. A totally flat 48 mm by 42 mm titanium case is split into nine squares, eight filled with movable counters and one left empty like a sliding puzzle. These counters, separated by lines symbolizing those of latitude and longitude, enable the wearer to set and measure time in the current location, plus three others. 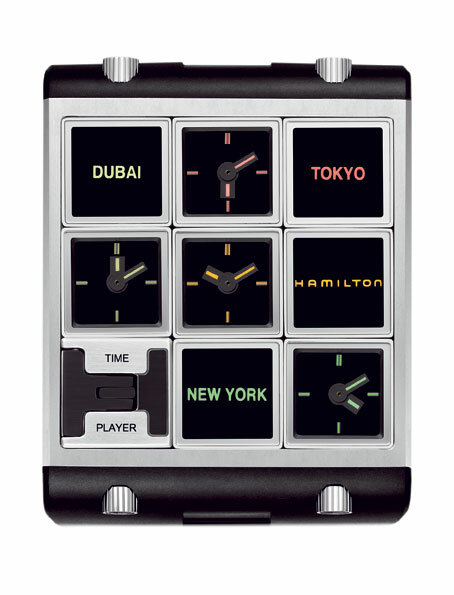 A Hamilton logo marks the here and now, while the additional three places are identified by color-coded printed names of the dynamic metropoles, Dubai, New York and Tokyo to prove that the brand is always on the move. The remaining four counters are all individual watch dials, in colors to match the corresponding location, so that they can dedicate their energy to tracking the passage of time in the defined destination. To set the time in a desired time zone the wearer simply moves the corresponding miniature watch to the central square and adjusts via a crown. Once this is done, all of the counters can be moved around again at will. Two easy to grip crowns are positioned on each of the two sides of the case where the attachment joins. The thick black rubber strap also picks up the theme of right angles with corresponding indents and a neat folding buckle. Price Rs 1,45,800. 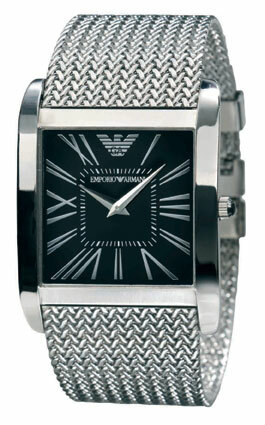 Emporio Armani introduces its Fall/Winter 2010 watch collection focused on two main design elements: a super slim case shape and metal mesh bracelets. A colour palette focused on silver-grey tones combined with neutrals and metal finishes sets the mood for the collection. Produced entirely in stainless steel, Giorgio Armani draws inspiration from his use of 3-dimensional textures and textiles to make a bold statement with meshed metal bracelets. Luxurious and innovative, new technology allows intricately woven mesh to be exquisitely applied to an integrated-bracelet construction that comfortably hugs the wrist. Steel mesh bracelet styles also include versions developed in yellow gold ion-plated stainless steel as well as black ion-plated stainless steel while more traditional interpretations include models with 3-link stainless steel bracelets, featuring polished outer links and brushed centre links. In place of metal bracelets, the range also includes styles that use buttery smooth calfskin leather to produce strap models with butterfly deployant buckles. Material combinations include stainless steel cases with black or cognac coloured straps as well as black ion-plated stainless steel cases with smooth black leather straps. Price: Ranges between Rs.12,495 to Rs.34,995. 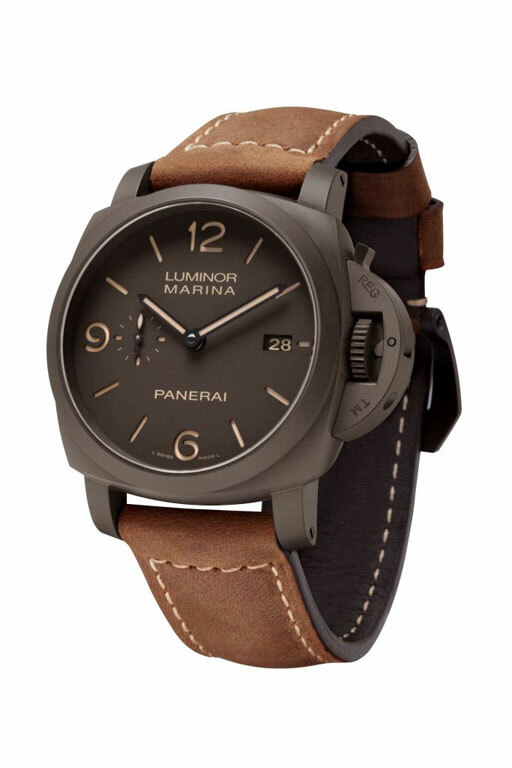 What’s so special about Luminor Marina 1950 3 Days Automatic Composite ( 44 mm)? The case and the bridge protecting the winding crown are executed in Panerai Composite®, the synthetic ceramic, used in haute horlogerie for the first time by Officine Panerai, is created by an electro-chemical process involving the transformation of aluminium. Though It much lighter than ceramic, Composite is much harder and more resistant than steel, furthermore it is matt and extremely distinctive in appearance. The large, unadorned brown dial is of a sandwich construction consisting of two superimposed layers containing the Super-LumiNova® which forms the fluorescent figures and hour markers. High legible even in the dark, the dial is protected by a smoked sapphire crystal with anti-reflective treatment. The P.9000 automatic movement, which can be observed through the sapphire crystal case back, is 13 ¾ lignes in diameter and 7.9 mm thick. This calibre has a date function, small seconds at 9 o’clock and a power reserve of three days, achieved by two spring barrels connected in series, with an oscillating rotor which winds the springs in both directions. Water-resistant to about 300 metres, the watch is supplied with a strap of antiqued brown leather, with a Composite buckle of the same colour. Identified by the reference PAM00386, it is part of the Contemporary collection. Luminor Marina 1950 3 Days Automatic Composite ( 44 mm) will be available in stores from January. The just-launched Monaco V4 Next Generation Rose Gold Ruthenium and Ceramic has the latest version of TAG Heuer’s groundbreaking V4 technology. 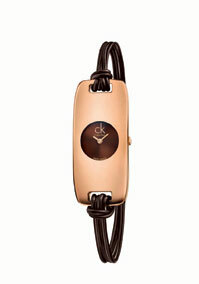 It is also the brand’s most stylish creation in rose gold to date. The double-patented Monaco V4 is the world’s first watch with a high-yield mechanical belt drives and a linear rewinding system. Its audacious design is based on the oversized, square-faced Monaco, first seen on Steve McQueen’s wrist in the 1970 race film Le Mans. In this new “Next Generation” version, the case is even bigger (41mm instead of 39mm) and made of polished massive rose gold with fine-brushed silicon nitride “ceramic” inserts. The inserts visually lighten the squared shape of the watch, and the newly angled planes of the bevelled crystal give the watch a more fluid and contemporary profile. Other rose gold components are the hand-applied faceted indexes on the dial, the minute and hour hands, the small second hand at 4 o’clock, the thermo-lacquered crown at 3 o’clock, and the strap’s folding buckle. The strap itself is in ultra-soft, large-scale alligator, with anthracite hand stitching, titanium inserts and a rubberized leather lining. Visible through the timepiece’s anti-reflective sapphire crystal front and back — the V4’s avant-garde architecture remains unchanged (tungsten ingot linear mass, two pairs of barrels in series, set in parallel and linked by belts), but the finishes have been completely revisited, with a high-resistance black ruthenium coating on the back plate and the Côtes de Genève decorated bridges. The beautiful black juxtaposes superbly with the white “V4” and “TAG Heuer” engravings on the dial, and with the patented transmission and rewind white belts, now in high-contrast, high-tech white polymers exclusively developed for the new timepiece. Only 60 pieces worldwide. Grieb & Benzinger are at it again. 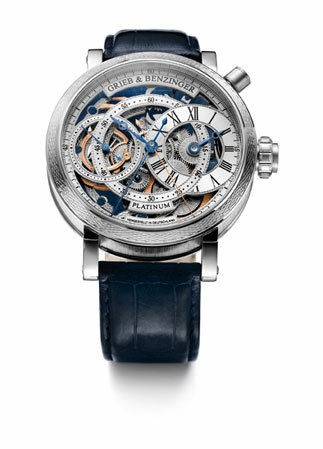 After their Blue Wave 18 carat rose gold monpusher chronograph only watch they now offer another unique timepiece: Blue Sensation regulator chronograph which is Based on an antique Patek Philippe hand-wound movement built for Tiffany, an American jewelry and silverware company founded in 1837. The movement in question was built in 1889 and powered pocket watches that were sold through Tiffany & Co. boutiques in 1890. Of course, by the time it was chosen to power a new masterpiece from German watchmakers, the movement needed serious cleaning and restoration. Then more restoration, skeletonization, engraving and guilloche, all done by hand with countless disassembling, reassembling, adjustments and more disassembling. In total the movement was reassembled more than 20 times to ensure that the device works as it should after all the necessary modifications to convert the original movement into a skeletonized regulator chronograph watch. The result, as usual, is stunning. The dial now features three overlapping subdials: a small seconds display at 9 o’clock, minute counter right in the center and the hours subdial with bold Roman numerals on it is transferred to the 3 o’clock position. Of course, there are two central second hands (one blued and one in rose gold) because this is a split-seconds chronograph. The 49 mm round case is made of platinum. In fact, there is so much platinum here that it tips the scales at around 165 gms! And the price is €197,500! As the name suggests, the Centrix expresses the circle in its purest form. Classic and fluid, the authentic design and shape best embodies elegance with clarity. 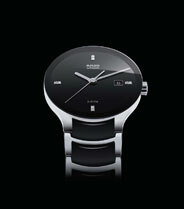 Rado has once again exploited its unrivalled knowledge in producing this timepiece. The tapered bracelet gently and sensually embraces the wrist. Highly flexible, it offers exquisite comfort and elegance to all who wear it. The automatic is sleek with a silver finish and also comes in a jubilé version with eight single diamonds delicately set on the black polished dial, giving it a simple yet tasteful aura. A more refined version of the Centrix has a mother of pearl dial which is further adorned with a line of diamonds on its circled edge. Three steel colored hands and the date at 3 o’clock, all protected underneath the finely metallized edge to edge sapphire crystal. You can choose the Centrix that fits your style. Choose from three different styles all with uncompromising luxury. The collection starts from Rs. 34,000. You are currently browsing the watchalive weblog archives for November 2010.